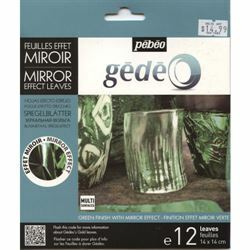 Mirror Effect Metal Leaf A fun and simply way to add high gloss mirror effects to your Mixed Media creations. Multi surface, high gloss sheets of mirror effect metal leaf to be placed over selected areas to highlight and enhance artworks. SURFACES Can be applied using gilding paste on most surfaces: Liquid Art Panels, glass, wood, metal, terra cotta, ceramics, paper and cardboard, canvas, mirror, Plexiglas, plastics, as well as on jewelry bases and decorative objects. Pebeo Guilding Paste 37 ml.